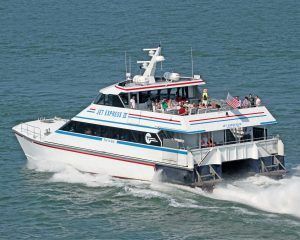 Travel to Put-in-Bay in style on the Jet Express Ferry. The smoothest and fastest way to travel to South Bass Island, the Jet Express docks right downtown. They also provide the only late night ferry service on and off the island. The Jet Express ferries are designed exclusively for passengers and light freight. There are several different mainland docks which include Port Clinton, Sandusky, or Cedar Point, OH. There is also an inter-island service between South Bass Island and Put-in-Bay. If you plan on spending a day exploring these islands, purchase an Island Hopper ticket for only $50. 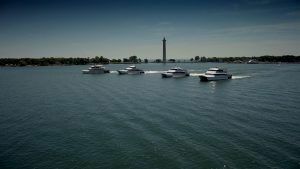 The streamlined, dazzlingly white vessel travels at 42 miles per hour, which makes it the fastest way to Put-in-Bay. Children under five travel for free and reservations are only available at the Port Clinton terminal. This is because it is the most popular port. Reservations can now also be made online and with every paid ticket, passengers also receive a value packed coupon sheet. If you plan on traveling from Port Clinton on a Saturday it is highly advisable you make reservations in advance. Port Clinton also features JetBar where passengers can enjoy a cocktail or glass of wine to commemorate the beginning of a Put-in-bay vacation. Jet Express packages make traveling to and from the island a breeze. They also include deals for golf cart rentals, which is the preferred mode of transportation on Put-in-Bay. Jet Express is not only speedy, but offers a very comfortable mode of travel. The attractive dual hulled catamaran can easily traverse the waves of Lake Erie. The ride is always very smooth due to the ferry’s unique design. In the event of a storm, charters can occasionally travel to the island such as Griffing Airline and Island Air Taxi. The interior is air-conditioned and luxurious. The upper deck provides a lovely, expansive view of the lake and surrounding islands. On clear days the Canadian Islands are also visible. The outdoor top deck is best place to catch a few rays and soak in the pleasant island breezes. Each mainland port offers different parking options. Port Clinton includes a long term lot and Sandusky has free parking during the day. Check the parking at your preferred dock before planning your trip.